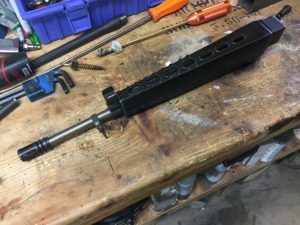 The build of the SAR-80 continues with the modification of one of the AR180B barrels that Numrich was selling. I say was because they were quickly snapped up (all 5 of them) after it was discovered they would be the easiest to modify for the SAR-80. The 180B barrel has the same threads as the SAR-80 and the AR-180 but they are not as long. 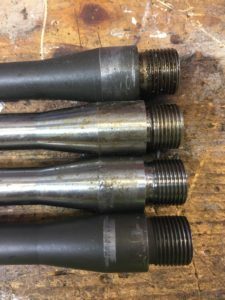 We need to turn the shoulder back .067″ but every barrel/trunion/bolt combination will be different based on headspace. I started with an aluminum rod that was turned in the 3-jaw to make a center. 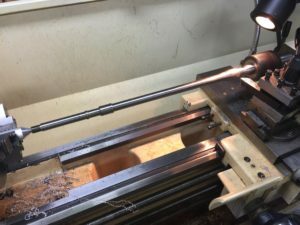 I find this the fastest way to ensure the barrel runs true when turning. 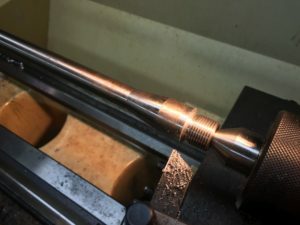 The rifling in the barrel bites into the soft aluminum and turns the barrel without a dog. Just don’t take very big cuts! 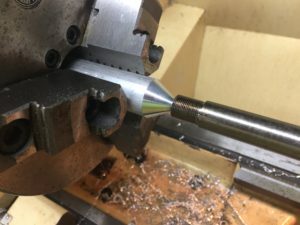 I turned the shoulder back about .060″ and then started checking headspace and turning more until I got it set. 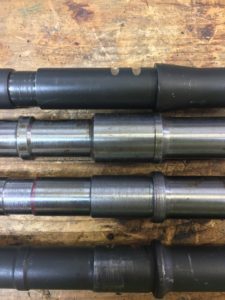 I didn’t get any pics of the second and third operations but they were nothing more than turning the diameters down to size. I was not able to use the same setup and had to chuck it up close to the cut to reduce chatter. The picture below shows the comparison of the the original cut SAR-80 barrel on top. The unmodified AR-180B barrel second from the top. The modified AR-180B barrel third and an original Sterling AR-180 barrel last. You can see how far back the shoulder had to be turned back to set headspace. 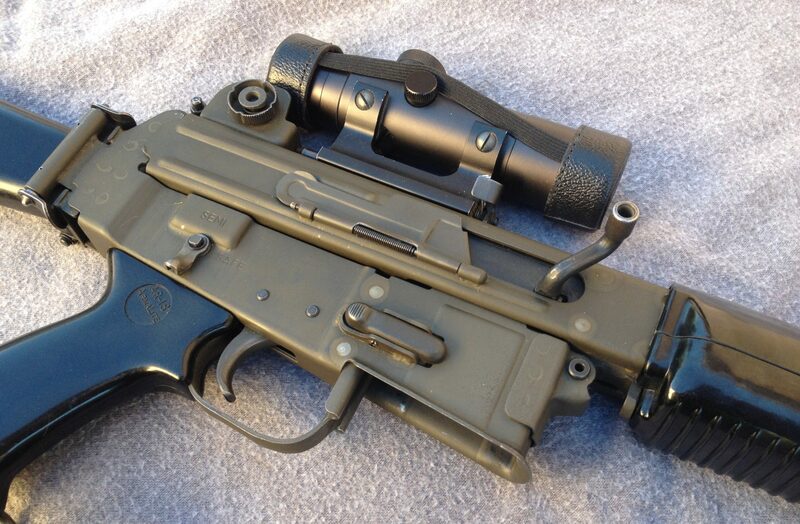 The AR-180B barrel is the same as an AR15 barrel with the extension removed. Here you can see the mods that were done so the front sight base and sling swivel would be installed. The diameter in front of the front sight on the AR-180B barrel is smaller the the SAR-80 but there is still enough meat to use the sling swivel if you want. For those lucky few this made for a quick way to get up and running. Whats the option going forward? 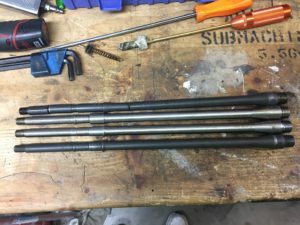 I have a guy who is willing to turn a batch of barrels to the original SAR-80 dimensions. Unlike the AR-180B barrel (no chrome 1-9″) these would be chrome lined and a 1-7″ twist so any ammo could be used. Parkerized and ready for final headspace, therefore no gas port will be drilled, he could do them in the $300-350 range depending on the number but I think a minimum of 10 would be needed to get the ball rolling. Email me at rick@ar180s.com if you have any questions.